SMART Notebook - The worlds most widely used education software is created and refined based on feedback from educators. It provides a wealth of intuitive, easy to use tools and features to drive exceptional lessons using the front of class display, whilst increasing student engagement and attainment. SMART amp - Enhance any teaching or learning style with this cloud-based solution, accessible anytime via an interactive display or student device. Offers teachers classroom management, assessment capabilities and the ability to co-create, share and collaborate with students within an interactive workshop. SMART Lesson Activity Builder (LAB) - The greatest gift that can be given to any teacher is time. For students its more fun with engaging activities. The Lesson Activity Builder does both by letting teachers captivate students for hours with learning activities that they create in 5 minutes. 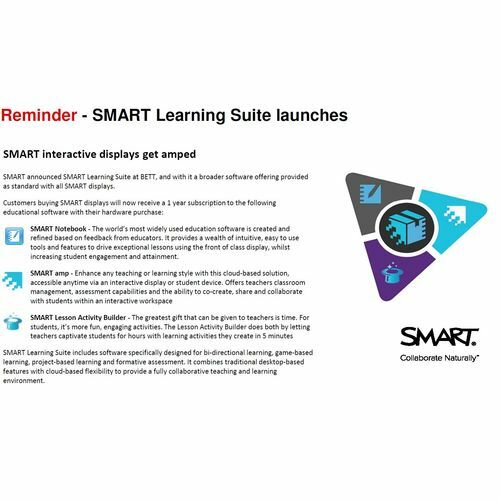 SMART Learning Suite includes software specifically designed for bi-directional learning, game-based learning, project-based learning and formative assessment. It combines traditional desktop-based features with cloud-based flexibility to provide a fully collaborative teaching and learning environment.